When painting the interior walls in your home during a home remodel, making color selections can be daunting. Do these colors go together? How do I accommodate my child’s desire for a neon wall color? What do I do in the hallways or on the ceiling? With so many questions to answer - it can be easy to feel overwhelmed and unsure. However, the process can actually be a smooth and enjoyable one if you pay attention to a few key factors, and work with a painting contractor that has insight into your unique home and the personalities within it. An excellent place to start is your “color constant”, or the shade that you are going to use in some shape or form throughout your home. This will be the paint you use in the entryway, the hallways, and into the main living space. It defines a flow into the home, and sets a backdrop for your accent colors. This color does not need to be overly basic, it simply needs to be neutral enough to allow the bolder selections to shine. Maybe your love of blues manifests itself as your color constant in the form of a gray-blue that allows the brighter shades to cohesively coexist. Or perhaps you want to go with a muted olive green that provides a jumping off point for additional earth-tones accents. No matter the exact shade, creating a single hue for this entry-hallway-main living space flow is key to accomplishing that cohesive feel. Now that you have your first major color decision checked off the list, you will want to keep sight lines in mind as you move to additional rooms. When you can see your dining room and office from the kitchen, for example, you’ll want the wall colors to compliment each other - even if those walls don’t directly come into contact with one another. Because your eye will be taking in all of those shades at once, you want to avoid distinctly different or clashing colors in each room. When you are designing each specific room during the remodel process, it can be easy to forget the big picture, and make choices that might work within the walls of say, the dining room, and forget that the color you select looks terrible when viewed within the same sightline as the color you chose in the office. By maintaining a complimentary color palette, you will be sure to love how the house looks as a whole as well as within the walls of each room. But what about the bold? If you are drawn to a wall color that makes a statement, even if that statement is a standalone one that does not compliment the main areas of your home, let yourself embrace those more impactful hues within rooms that have four walls and a door. 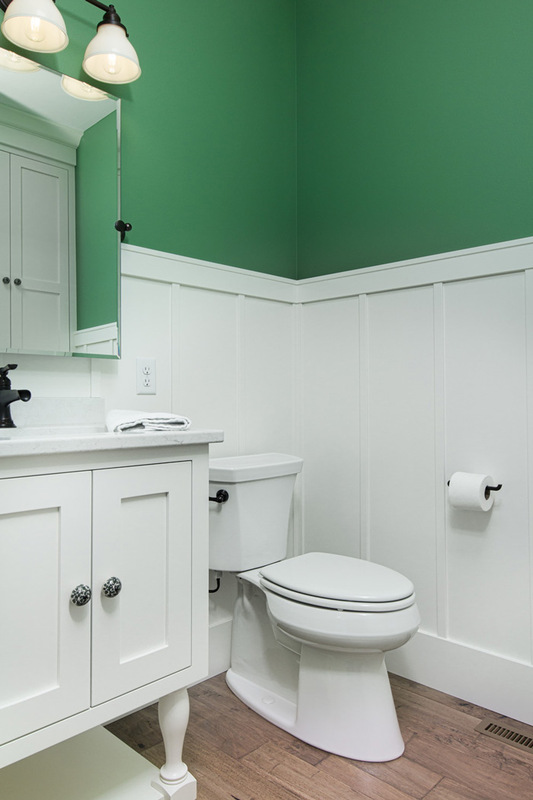 The bathroom, for example, can be a fun place to play with a bright shade. This is where a child’s imagination can come to life too - as their room is removed from the design flow you are creating in the main living space. If you are battling with a child’s choice that is too out-there, say highlighter orange or a fluorescent magenta, find hues that are a more subdued version and then let him or her pick from there. Include them in the process, allowing them to feel a sense of ownership in the color of their space without giving in to something that is way out-of-the-box. Another great way to embrace bright colors and also create cohesion is through accents. So even if you decide that a coral wall is not the best idea, but you are in love with that color for your interior design, put throw pillows on the living room couch in this vibrant hue. Add a table lamp with a coral base in the office. And hang a painting in the dining room that has a coral-driven palette. The idea behind wall paint is not to be boring or constantly neutral, it is simply a matter of picking shades that compliment the overall aesthetic, work well together, and create a beautiful backdrop for the accessories you choose to bring into the spaces. Are you looking to add color to your walls? Or maybe you are stuck with a color that is not at all what suits you and your family, and you need suggestions for how to best cover it. The Coatings Authority is your answer for not only the best in quality coatings, but in providing advice garnered from two decades experience working with a multitude of families. Our AUTHORICOAT process ensures that no matter what colors you choose, your surfaces will be properly prepped, the best paint blend will be used, and the end result will look simply stunning and stand up to the test of time. If you are ready to start your painting projects, fill out our painting form by clicking this link! We will be in touch with you within 24 hours to begin the conversation. Now that we are officially over a month into 2019, the design trends for the year are really starting to solidify. One that continues to come up everywhere - from websites to magazines to Pinterest boards - is dark kitchen cabinetry. According to Real Simple, all the experts agree that dark colors are making a big comeback this year. The whites and grays that dominated the kitchen design scene are taking a back seat to these bold, beautiful hues. Everything from matte black to navy to forest green will be huge this year, and as predictions note, well beyond 2019. Just because something is “on trend” does not mean it isn’t timeless, and when you take a closer look at these rich colors popping up in kitchens big and small, it is easy to see why. While going dark in the kitchen color palette might seem like an intimidating or extreme choice, in practice it makes a statement without being outlandish. You can ease your way into the darker color options by only going dark on the island - still making a statement, but not applying that color throughout. Additionally, there are design decisions that make the dark color cohesive with its surroundings - including flooring choices, backsplash changes, countertop selections, and wall and trim colors. An incredible asset we offer at The Coatings Authority is a partnership with our sister company, The Home Authority. 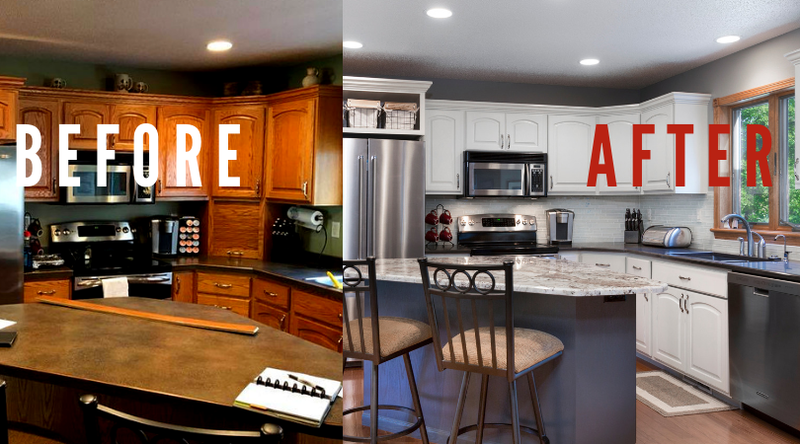 When additional remodel decisions start to feel overwhelming or confusing, we are able to offer the expertise of over 2 decades in renovation experience through THA, ensuring that the process does not take a turn into stress-overload. 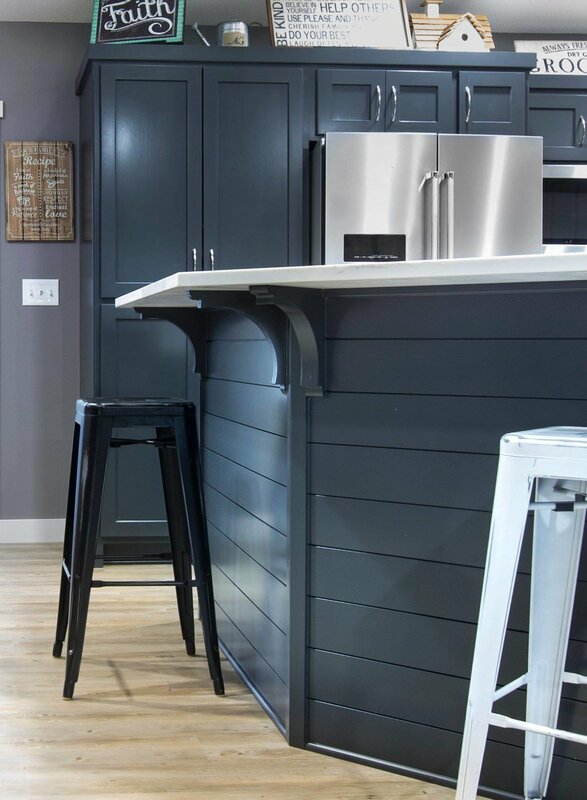 Another absolutely critical factor in putting a dark custom coating on your cabinets is ensuring that coating is applied correctly. When applying dark paint, the surface absolutely must be prepped properly so that the finish is smooth. Brush marks can make or break the look of a dark cabinet color, and be the difference between beautifully done and DIY gone wrong. Our AUTHORICOAT process is multi-faceted, including the best in surface preparation, a proprietary paint blend and coatings application method, and an end result that will stand up to daily wear and tear. When you are in the kitchen, or anywhere in your house for that matter, you want to be able to focus on what you are doing and the tasks you are trying to accomplish without concerning yourself with gently navigating around your cabinetry. A truly quality coating can hold up to constant use, and stand the test of time. This is the fundamental reason behind our developing the AUTHORICOAT process - to provide a product that not only looks great on day one, it looks just as beautiful years down the road. When you work with The Coatings Authority, you can rest assured we will not only provide quality, we will complete your project within an incredibly efficient timeframe that will allow you to enjoy your transformed space as quickly as possible. We have a step-by-step process that we share with you right from the start, allowing you to understand and follow along with what we are doing throughout. We disassemble all of the doors and drawers, take those components back to our shop to coat, and spray your cabinet boxes on site. Thanks to the dedication of our phenomenal team, we prep every surface and tape everything with impeccable precision - resulting in clean lines and a stunning, like-new finish. Are you ready to transform your space through custom cabinet coatings? Click through this slideshow of homes where we have utilized these bold and beautiful hues for some inspiration, and contact us today to talk about how our quality AUTHORICOAT process can change your home for the better. Make a timeless trend a reality in your home with The Coatings Authority, and start today by filling out our project form here. We cannot wait to hear from you! If you have laminate countertops, do you notice the slight overhang or lip on their edges? This seemingly innocuous touch can actually cause a significant issue when refinishing cabinets. 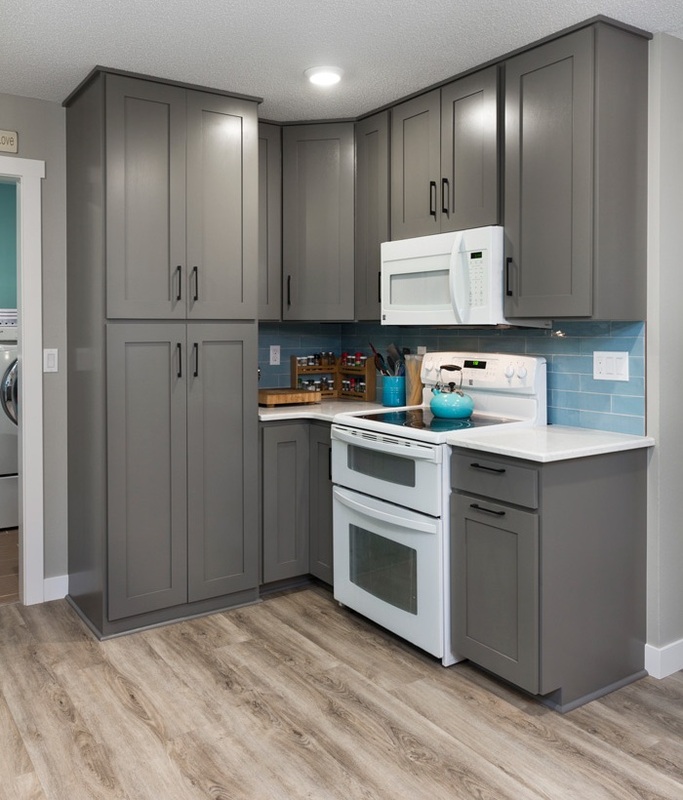 Thanks to our decades of experience in painting cabinetry, we have learned the necessary steps to take no matter what kitchen we are working in, and are able to adapt to any scenario. When we refinish cabinets in a kitchen with laminate countertops that are being replaced, we actually tackle the project a bit backwards. The countertop is replaced first due to the overhang, or lip, that can be found on many laminate tops. In order to spray the entirety of the cabinet box, we need that countertop taken off first - allowing us to access every square inch of the cabinets. 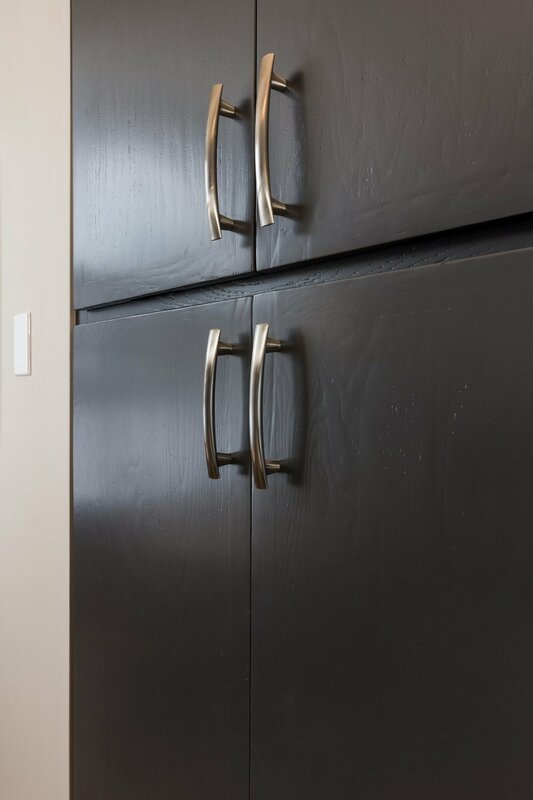 It is details like these that make working with a professional for your cabinet refinishing key, and we love utilizing the proper techniques to ensure a quality finish no matter the project. Our AUTHORICOAT process ensures a factory-like finish no matter the surface we apply it to. Because we don't cut any corners, we make sure every surface is equally accessible and prepped properly, providing you a like-new kitchen for a fraction of the price. Whether you have a laminate lip or are keeping existing countertops, we will bring your cabinetry vision to life. We are taking you inside our shop with today’s post - showing you where we are applying our coatings when we aren’t on-site! While we are certainly outgrowing this space, we have developed clever organizational systems that help us keep things sorted and allow us to work on multiple projects at once. The shop houses our spray booth, and our mixing station where we create the custom paint blends that make our AUTHORICOAT process so successful. 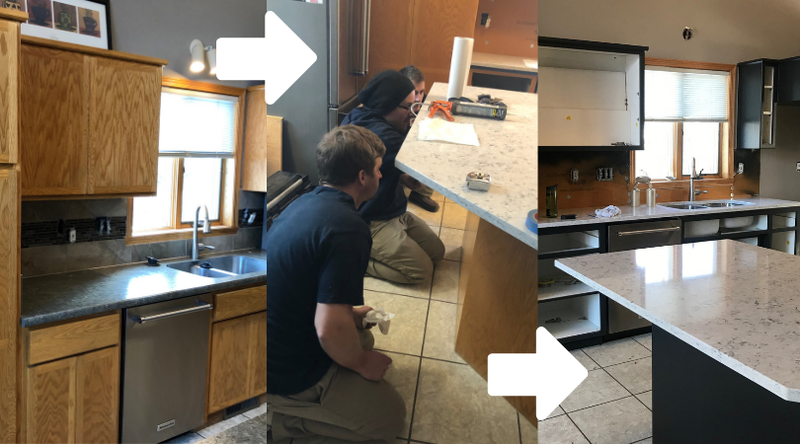 As you can see in these photos, we are in the process of refinishing cabinetry for a project we are completing for The Home Authority, and all of the doors and drawers are brought here to be prepped and painted. Interested in learning more about the AUTHORICOAT process? Click here! Winter brings plenty of wonderful things to our region - beautiful snowfall, holiday traditions, and more time with family...just to name a few! But with all of that winter wonderland magic comes slippery conditions that can spell trouble if you are not prepared. One place you don’t often consider being a potential hazard is your garage...but the floors in this space can be particularly slip-prone with snow covered boots and puddles from ice and snow melting off your vehicles. This is where a quality concrete coating can save the day! Did you know that a properly applied floor coating can actually help prevent slipping? Thanks to our over two decades experience applying custom coatings to our area’s garage floors, we know what products work best for our climate, and are able to provide peace of mind when considering the potential pitfalls a slippery surface can entail. Not only do our products look fantastic year round, their function really shines during our ice and snow filled winters. Let us provide a garage floor that checks all of your boxes this season! Think about a brand new surface that is being painted - whether it be a wall or a cabinet or a floor. Without years of wear and tear, grease and grime, etc. - the paint goes on smooth thanks to the natural surface. When refinishing a cabinet, repainting a wall, or applying a concrete coating over a well loved garage floor, the surface is in no condition to accept the coating in a way that will look like new, or stand up to the test of time. We know that a properly prepped surface is key to getting you a factory-like finish, which is why we take the time to bring things back to the bare bones with methods we have time-tested over 22 years. Because every space is different, the condition of the surfaces are different. That is why we don’t have a one-size-fits-all surface prep system. We assess each unique surface and address any issues on a project by project basis. For example, if there are grease splatters on kitchen cabinets, we will use appropriate cleaning products coupled with sanding to ensure the surface is properly cleaned. A key to a successful coating is that the paint/stain.etc. penetrates the surface vs sealing in previous issues (like grease splatters). We do not simply go to the store, pick out the right color of paint or stain, bring that bucket back to the shop or job site, and put that directly on the surface. We create custom blends by mixing various products together, ensuring a smooth and optimal finish. Through our decades of experience, we have figured out what custom paint blends move through our sprayers the smoothest, and coat the surfaces in a way that creates a look that is both aesthetically pleasing and durable. Our taping process consists of multiple steps, regardless of the surface we are painting, and is unique in that we actually spray past the tape and onto the surrounding wall. For example - when we paint kitchen cabinet boxes on site, we paint the walls around the edges. We then use touch up paint on the walls to (of course) cover the overspray from the cabinet, and then cut the tape edge and remove it. The result is an almost unbelievable straight edge, with no tape marks or uneven lines. It truly gives you the look that your space is new again! The motivations behind making changes in your home - from painting walls to gutting a kitchen - can vary significantly. Sometimes the change is something you have lived with for years, and are finally able to tackle. Other instances involve a new-to-you home that you want to make your own. And many times making updates has to do with needing to prepare your home to sell. No matter the motivation, there is an overarching goal that applies to every home project, and that is a positive Return on Investment. Obtaining a positive ROI is certainly not guaranteed - and there are plenty of stories out there of homeowners who poured money into a remodel and did not get what they wanted out of it. Ensuring that you not only love your space, but benefit financially from it, is something that our sister company, The Home Authority, is currently focusing on through an educational series titled “P.R.O.F.I.T. - Plan Remodel Outcomes From Investment Together”. Through blog posts and a video series with local experts, P.R.O.F.I.T. aims to shed light on the complexities of remodeling ROI and provides tips and insight into making calculated remodel decisions that can benefit you both financially and aesthetically. Click the links below to see the series progress both on facebook and The Home Authority’s blog. The information is not exclusive to full-scale remodels, and can absolutely be applied to projects like wall painting, cabinet refinishing, and floor coatings. Make sure to check it out! It can be difficult to understand the complexities involved in applying a custom coating. In fact, the preparation before any paint is even brought onsite is incredibly extensive. We go the extra mile to create an environment that allows for our proprietary application process, AUTHORICOAT, to be applied successfully. This prep work also preserves the quality of the surroundings, and gives you peace of mind that not only will your cabinets/railing/walls/etc. be coated seamlessly, but the rest of the room will be properly protected. The coating itself is only one part of the process. We also prep the surface that the coating will be applied to, ensuring that the coating will adhere properly and actually last. We want our projects to look fantastic months and years later - and we firmly believe in providing something that not only looks good, but is actually functional. By making the extra effort up front, we are able to give you something with true quality. Head over to our facebook page to find videos of the mobile spray booths we create on site for everything from kitchen cabinets to railings. As you will see, we don’t take any shortcuts when it comes to providing you an exemplary product! 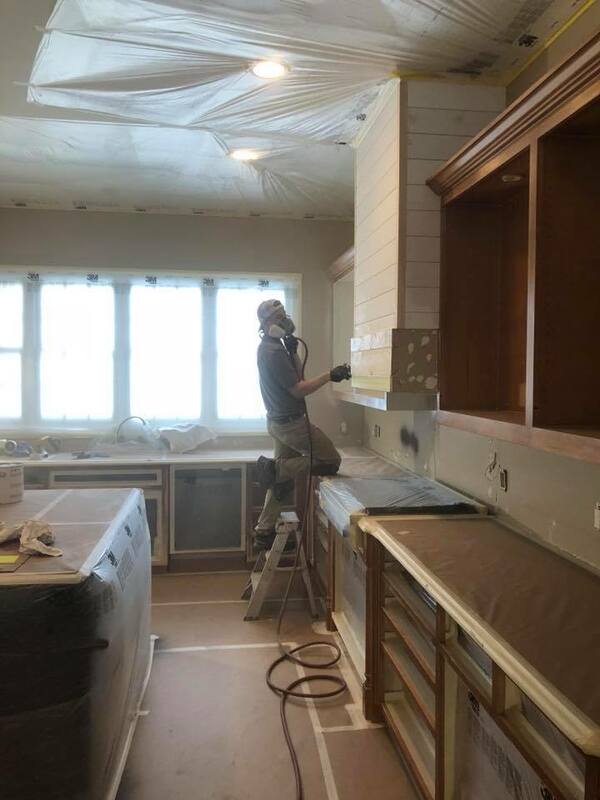 We recently wrapped up a project with our sister company, The Home Authority, and completed all of the coatings for a family’s whole-home remodel. Projects of this scale are incredibly exciting, but it can be difficult as the homeowner to puzzle out what colors would look best where, what shade will look best with the flooring choices, etc. etc. Understanding how to make these color decisions is no easy task, and we do everything we can to make these choices as easy as possible. In the case of our latest project, the homeowners were debating between two different colors for the kitchen cabinets and island. Trying to make a final decision based on two tiny swatches was proving to be impossible, and the homeowners could not come to a choice they felt great about. In order to make things easier, we took two of the old cabinet doors we had removed from the kitchen and applied a coat of both colors to each door. We brought the doors back to the home, and hung them again so the homeowners could get a better feel for the colors in their space. They quickly came to a final choice thanks to this improved visual, and the end result was better than they could have envisioned. Our goal is not just to provide a seamless finish or a beautiful coat of paint, we also want to work with our clients to give them just as much confidence in the process as the end result. You hear the word “custom” thrown around a lot from a variety of businesses via many different marketing messages. And it makes perfect sense - it feels good to believe that what you are getting, no matter what it is, is custom to you. Particularly in the realm of homes, from building to furnishing, “custom” is a hot-button word. But what does promising custom actually mean? And how far are businesses willing to go to follow through on such a promise? For us, saying we offer custom coatings is more than just an attention-getter. We will provide you the coating solutions you desire for your home or office - even if it is something we don’t typically provide. An excellent example of this can be found in a railing we recently completed for a family working with The Home Authority. They envisioned a rich, darker tone for their entryway’s railing - a look that will make a beautiful statement upon entering the home. 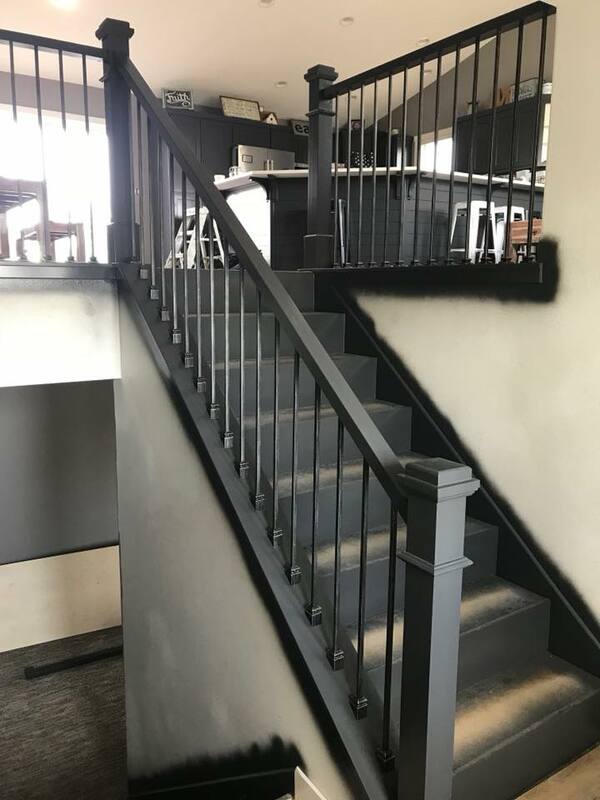 However, in order to preserve the finish and ensure that the end result was the smooth look we consistently provide, we could not complete the coating in our shop and transport the railing to the house. Instead, we brought our shop directly to the project…packing up all of the necessary tools and applying the paint directly to the railing on-site. This willingness to do whatever it takes to bring a customer’s vision to life is our definition of custom - and something we are thrilled and proud to provide. stay connected with our social media! check out our sister company!